1. Which one fits my motor? You must know the motor make, year, HP, long or short shaft, remote or tiller steering, number of cylinders and whether it’s through hub exhaust or not. 3. How about a heavy load? A heavily loaded prop boat using a low pitch prop can haul much more weight than we can. 5. Why don’t we stock jets? We manufacture over eighty models. Demand varies and motor designs change. We build for nine different motor makes, from six different motor manufacturers. 7. How high exactly do you have to raise the transom? The height is approximately six inches higher than with a propeller. It varies between different motors and boats. When the jet drive is on the motor, set the height so that the leading edge of the intake is flush with the boat bottom. Then test the boat and adjust the height, if necessary, as high as possible without air entering the pump and causing cavitation (slippage). 8. Do we have adaptors to fit a particular jet drive to different motors? 12. Why don’t we make jet drives for less than 25 HP? We lose about 30% of the HP when converting from propeller to jet drive. With less than 25 HP, it is difficult to plane a boat with two people. If it won’t plane, it will not operate successfully in shallow water. 13. How far does the jet go down into the water? The water intake grill slopes down to the rear to give a scooping effect. The leading edge is flush with the bottom of the boat. The trailing edge is about two inches lower. 14. Does a stainless steel impeller improve performance of a jet drive? Stainless steel impellers work well on motors above 100 HP. They give less slippage on start up and therefore can pickup a heavier load. Top speed of, maybe, one to two mph or better. Below 100 HP, the main advantage is longer wear life. 15. How do you remove frozen hardware? 16. What can cause RPM to be too low or too high? Load has nothing to do with RPM on a jet drive (see question number 4, 11). Impeller pitch and diameter is based on sea level operation. 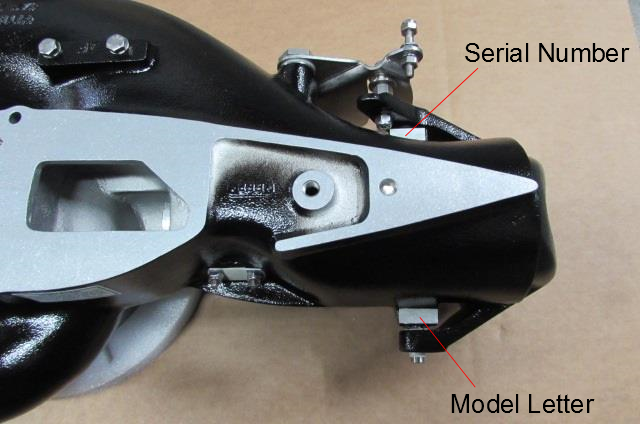 At higher elevation, you will lose RPM and may have to drop down one impeller size. Long use in corrosive conditions may create pin holes in the exhaust tube which builds up back pressure and reduces RPM. Excessive RPM is usually caused by air entering the pump. It can be caused also, during start up, if the leading edges of the blades are blunted from gravel. A rough boat bottom, keels or damage ahead of the intake can introduce air, as well as setting the motor too high. 17. Moisture in grease – when do seals have to be replaced? Grease coming out the lube hose is usually light gray. If droplets of water appear, then the seals are leaking and should be replaced. If you grease after the days use, so that the bearing is not stored with moisture in it, you can delay replacement until it is convenient. 18. What is SF & D? This stands for Spot Facer and Drill kit. It is used to drill a hole and spot face a seat to receive a bolt from above at the rear of the engine midsection. This is not used on all motors. See the Jet Drive Kits list. 19. How do you sharpen impeller blades? We have an instruction sheet entitled “Impeller Sharpening” which can be faxed to the customer, or open the Impeller Sharpening pdf. 22. Explain the use of bearing backfit kits. Early jet drives used a single bearing with two rows of balls. Present design uses an angular contact bearing with a single row of balls, but with higher thrust capacity. The backfit kit allows use of the higher capacity single row bearing in place of the double row bearing. 23. Explain the difference between early type and new type intakes and flanged liners in the large jet drive series. The early type intakes use liners for 6 5/8, 6 7/8 and 7 3/16 impellers. If the liner is removed, and the mounting holes plugged, a 7 3/8 impeller can be used, but there is no replacement liner for wear. The new type intake uses a liner for 7 3/8. The casting is larger on the outside to accommodate the 7 3/8 liner. It is identified by the bolt head relief in the castings for wrench clearance at the six holes. The flanged liners eliminate the need for side bolts to hold in the liner. Six studs are held in the main housing with Loctite and fiber lock nuts are used in place of the six mounting bolts. New type 7 3/8 intakes can be modified for flanged liners by removing the centering ring on the intake flange face and chamfering the sharp edge. 25. What’s the difference between the 7 3/8, 7 3/8 D and 7 3/8 V6 impeller? The outside diameter is the same, but the pitch is steeper going from 7 3/8 to 7 3/8 D to 7 3/8 V6 to handle higher HP. 26. How long does it take to change from prop to jet? About one hour; more the first time, less after you have done it. Raising the boat transom approximately six inches takes longer, depending on how you do it. If you plan to switch between prop and jet, depending on water conditions, winter, summer, etc., purchase a second cooling water pump so that each, the prop and jet drive, have one installed and you don’t have to transfer the pump back and forth. 27. 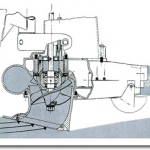 Can I put a short shaft on a long shaft motor so I won’t have to raise the transom? No. The jet drive shaft length must match the motor shaft length, or you would have to change the entire mid section of the motor. 28. How do we determine what shifting mechanism (cable or rod) to provide with tiller handle steered motors? If the shift handle is on the side of the motor, it usually requires a shift rod. The shift arm which attaches to the shift handle may be different for cam gates than for the earlier bell crank. 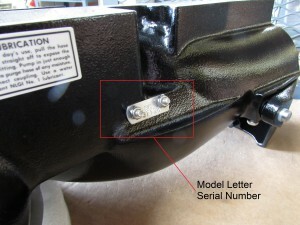 If the shift handle is on the front of the motor or on the tiller handle itself, it usually requires a cable assembly. Refer first to the jet kit pictorial / parts list. This will refer you to the pages showing the shift rod and cable mechanisms. 30. Will I have to raise my motor up on the transom for a jet? 31. What is the best type of boat to use with an Outboard jet? The boat is important. The best is a flat or slight vee, 10° per side maximum. Aluminum is the best because it is light, easy to repair with minimum maintenance. Fiberglass is heavier and shatters on impact. Inflatables with flexible bottoms introduce air. 33. Where are my Serial Number and Model Identification Letters located? Use these images to identify the location of your Serial Number and Model Identification Letters.